Top ranked Windy City Bulls (15-15) recorded its fifteenth loss in Hoffman Estates on Wednesday night. Hosts were defeated by fifth ranked Herd (6-22) 118-109. Herd outrebounded Windy City Bulls 46-35 including 36 on the defensive glass. Great defensive blocking was one of the keys in this match when Herd made 7 blocks. 28 personal fouls committed by Windy City Bulls helped opponents get some easy free throw opportunities. Forward Christian Wood (208-95, college: UNLV, agency: Pensack Sports) fired a double-double by scoring 33 points (!!!) and 12 rebounds for the winners. Vander Blue (196-92, college: Marquette) chipped in 16 points and 10 rebounds. Guard Brandon Sampson (196-97, college: LSU) produced 28 points, 6 rebounds and 4 assists (made all of his seven free throws) for lost side. Windy City Bulls' coach rotated ten players in this game, but that didn't help. Herd maintains fifth place with 6-22 record. Windy City Bulls at the other side still keep top position with 15 games lost. Another exciting game was between third ranked Erie Bay Hawks and their biggest opponent Fort Wayne Mad Ants where Erie Bay Hawks (15-13) beat Fort Wayne Mad Ants (14-14) on the road 135-123. Worth to mention a great performance of guard Jaylen Adams (188-96, college: St.Bonaventure) who helped to win the game recording 40 points (!!! ), 7 rebounds and 9 assists. Terrence Jones contributed with 30 points, 10 rebounds and 5 assists (on 11-of-14 shooting from the field) for the winners. Erie Bay Hawks' coach allowed to play the deep bench players saving starting five for next games. Guard Rob Gray (185-94, college: Houston) answered with 35 points (!!! ), 5 rebounds and 4 assists for Fort Wayne Mad Ants. Erie Bay Hawks maintains third place with 15-13 record having just one point less than leader Windy City B. Fort Wayne Mad Ants lost third consecutive game. They keep the second position with 14 games lost. Very important is a home loss of third ranked Austin Toros (14-16) against fourth ranked Texas Legends (11-20) on Wednesday night. Host Austin Toros were defeated by Texas Legends in a tough game in Austin 103-111. It ended at the same time the two-game winning streak of Austin Toros. Gary Trent-Jr stepped up and scored 33 points (!!!) for the winners. At the losing side Travis Trice-II responded with a double-double by scoring 26 points, 6 rebounds and 12 assists. Texas Legends maintains fourth place with 11-20 record. Loser Austin Toros keep the third position with 16 games lost. An exciting game was played in Canton. First ranked Magic faced 4th placed Canton Charge. Guests from Lakeland (17-10) defeated host Canton Charge (12-16) 116-104. It ended at the same time the three-game winning streak of Canton Charge. Amile Jefferson nailed a double-double by scoring 23 points and 10 rebounds for the winning side. Magic's coach used a ten-player rotation which allowed the starters a little rest for the next games. Magic have a solid series of four victories in a row. They maintain first place with 17-10 record. Canton Charge at the other side keeps the fourth position with 16 games lost. An exciting game was played in Southaven. Third ranked Hustle faced 4th placed Blue Coats. Host Hustle (17-12) defeated guests from Newark, Delaware (9-15) 110-106. Doral Moore fired a double-double by scoring 13 points, 17 rebounds and 5 blocks for the winners. Blue Coats' coach tested ten players, but that didn't help to avoid defeat in this game. Hustle maintains third place with 17-12 record having just two point less than leader Windy City B. Loser Blue Coats keep the fourth position with 15 games lost. In the last game of day 73 Raptors 905 was defeated by Westchester K. in a road game 111-102. Very important is a home loss of third ranked Austin Toros (14-16) against fourth ranked Texas Legends (11-20) on Wednesday night. Host Austin Toros were defeated by Texas Legends in a tough game in Austin 103-111. It ended at the same time the two-game winning streak of Austin Toros. Texas Legends made 38-of-47 free shots (80.9 percent) during the game, while Austin Toros only scored fourteen points from the stripe. Great defensive blocking was one of the keys in this match when Texas Legends made 9 blocks. Guard Gary Trent-Jr (198-99, college: Duke) stepped up and scored 33 points (!!!) (made all of his twelve free throws !!!) for the winners and guard Daryl Macon (190-95, college: Arkansas) chipped in 25 points and 5 assists (made all of his fourteen free throws !!!). At the losing side point guard Travis Trice-II (183-93, college: Michigan St.) responded with a double-double by scoring 26 points, 6 rebounds and 12 assists and forward Drew Eubanks (208-97, college: Oregon St.) scored 24 points and 9 rebounds. Five Texas Legends and four Austin Toros players scored in double figures. Texas Legends maintains fourth place with 11-20 record. Loser Austin Toros keep the third position with 16 games lost. An exciting game was played in Canton. First ranked Magic faced 4th placed Canton Charge. Guests from Lakeland (17-10) defeated host Canton Charge (12-16) 116-104. It ended at the same time the three-game winning streak of Canton Charge. Magic made 16-of-19 charity shots (84.2 percent) during the game. Their players were unselfish on offense dishing 24 assists. Forward Amile Jefferson (206-93, college: Duke) nailed a double-double by scoring 23 points and 10 rebounds for the winning side and forward John Petrucelli (193-92, college: Molloy) accounted for 18 points and 6 assists. Magic's coach used a ten-player rotation which allowed the starters a little rest for the next games. Guard Malik Newman (190-97, college: Kansas) came up with 24 points, 7 rebounds and 4 assists (made all of his twelve free throws !!!) and guard Scoochie Smith (188-94, college: Dayton) added 18 points, 8 rebounds and 5 assists (made all of his fourteen free throws !!!) respectively for Canton Charge in the defeat. Both teams had five players each who scored in double figures. Magic have a solid series of four victories in a row. They maintain first place with 17-10 record. Canton Charge at the other side keeps the fourth position with 16 games lost. Top ranked Windy City Bulls (15-15) recorded its fifteenth loss in Hoffman Estates on Wednesday night. Hosts were defeated by fifth ranked Herd (6-22) 118-109. Herd outrebounded Windy City Bulls 46-35 including 36 on the defensive glass. Great defensive blocking was one of the keys in this match when Herd made 7 blocks. 28 personal fouls committed by Windy City Bulls helped opponents get some easy free throw opportunities. Forward Christian Wood (208-95, college: UNLV, agency: Pensack Sports) fired a double-double by scoring 33 points (!!!) and 12 rebounds for the winners. Vander Blue (196-92, college: Marquette) chipped in a double-double by scoring 16 points and 10 rebounds. Guard Brandon Sampson (196-97, college: LSU) produced 28 points, 6 rebounds and 4 assists (made all of his seven free throws) and guard Walter Lemon-Jr (190-92, college: Bradley) added 22 points, 6 rebounds and 6 assists respectively for lost side. Both teams had five players each who scored in double figures. Windy City Bulls' coach rotated ten players in this game, but that didn't help. Herd maintains fifth place with 6-22 record. Windy City Bulls at the other side still keep top position with 15 games lost. An exciting game was played in Southaven. Third ranked Hustle faced 4th placed Blue Coats. Host Hustle (17-12) defeated guests from Newark, Delaware (9-15) 110-106. Hustle dominated down low during the game scoring 86 of its points in the paint compared to Blue Coats' 50. Strangely Blue Coats outrebounded Hustle 61-44 including a 20-7 advantage in offensive rebounds. Great defensive blocking was one of the keys in this match when Hustle made 9 blocks. Blue Coats were plagued by 24 personal fouls down the stretch. Center Doral Moore (216-97, college: Wake Forest) fired a double-double by scoring 13 points, 17 rebounds and 5 blocks for the winners. Point guard Marcus Keene (180-95, college: Cent.Michigan, agency: Pensack Sports) chipped in 21 points. Guard Shake Milton (198-96, college: SMU) produced 20 points and 9 rebounds and forward Ryan Anderson (206-92, college: Arizona) added 10 points and 17 rebounds respectively for lost side. Both teams had five players each who scored in double figures. Blue Coats' coach tested ten players, but that didn't help to avoid defeat in this game. Hustle maintains third place with 17-12 record having just two point less than leader Windy City B. Loser Blue Coats keep the fourth position with 15 games lost. We cannot really consider it an upset in the game between close teams in Westchester where their biggest opponent Raptors 905 (17-11) was defeated by third ranked Knicks (18-13) 111-102 on Wednesday. It was a key game for the second position in the league. Knicks dominated down low during the game scoring 74 of its points in the paint compared to Raptors 905's 36. Knicks forced 21 Raptors 905 turnovers. They looked well-organized offensively handing out 23 assists. Forward Isaiah Hicks (206-94, college: N.Carolina) fired 24 points, 9 rebounds and 4 assists for the winners. Guard Kadeem Allen (191-93, college: Arizona) chipped in a double-double by scoring 12 points and 10 assists. 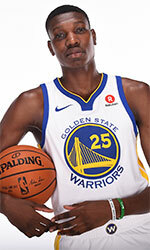 Canadian-Saint Lucian power forward Chris Boucher (208-93, college: Oregon) produced a double-double by scoring 25 points, 13 rebounds and 4 blocks and guard Josh Adams (188-93, college: Wyoming) added 21 points and 5 assists (perfect behind the arc making all five shots) respectively for lost side. Both teams had five players each who scored in double figures. Both coaches used bench players and allowed the starting five to rest. Knicks moved-up to second place. 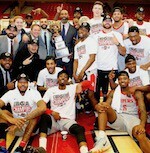 Defending champion Raptors 905 dropped to the third position with 11 games lost. Another exciting game was between third ranked Erie Bay Hawks and their biggest opponent Fort Wayne Mad Ants where Erie Bay Hawks (15-13) beat Fort Wayne Mad Ants (14-14) on the road 135-123. Erie Bay Hawks players were unselfish on offense dishing 30 assists. Fort Wayne Mad Ants were plagued by 25 personal fouls down the stretch. Worth to mention a great performance of guard Jaylen Adams (188-96, college: St.Bonaventure) who helped to win the game recording 40 points (!!! ), 7 rebounds and 9 assists. Forward Terrence Jones (206-92, college: Kentucky) contributed with a double-double by scoring 30 points, 10 rebounds and 5 assists (on 11-of-14 shooting from the field) for the winners. Erie Bay Hawks' coach allowed to play the deep bench players saving starting five for next games. Guard Rob Gray (185-94, college: Houston) answered with 35 points (!!! ), 5 rebounds and 4 assists and guard Edmond Sumner (198-95, college: Xavier) added 33 points (!!!) and 5 assists in the effort for Fort Wayne Mad Ants. Five Erie Bay Hawks and four Fort Wayne Mad Ants players scored in double figures. Erie Bay Hawks maintains third place with 15-13 record having just one point less than leader Windy City B. Fort Wayne Mad Ants lost third consecutive game. They keep the second position with 14 games lost.